Asus' Eee PC 1215N is the most powerful Intel-based netbook we've tested, enhanced by an attractive design and great-feeling soft plastic finish. However, it's let down by its poor keyboard and premium price tag, which puts it up against AMD's NEO-based ultra-portables and even Intel's own CULV machines. Though it certainly survives the encounter, it doesn't come away unscathed. With decent performance, reasonable battery life and a good design, you're probably wondering what the catch is. Well, somewhat unsurprisingly, it's the price. 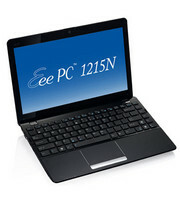 At £429 the Eee PC 1215N is considerably more expensive than most netbooks. The 12-inch screen makes a big difference, though, and the higher-than-average resolution allows you to fit much more onto the desktop. All in all it's a decent netbook, but you're paying for the extra features. And although it's undeniably faster than a single-core netbook, the speed difference isn't massive. Samsung is marketing the RF-series as "high-end performance notebooks matched with a futuristic design". In essence, we won't refute its performance clause, judging from satisfactory results garnered on the PCMark and 3DMark benches. After all, the middle class laptop does come with an adequate quad-core solution and discrete graphics. The Eee PC 1215N certainly isn't a bad effort from Asus, but it occupies something of an uncomfortable middle ground between bog-standard netbooks and fully fledged laptops. The performance increase over standard netbooks is definitely there, but it's not massive. That said, if you're after something small and light, and find the current crop of netbooks don't quite meet your power expectations, the Eee PC 1215N would be a good choice. Performance with the Asus Eee PC 1215N was quite good, especially with HD video and playing movies. Videos loaded extremely quick and performance with other tasks, like the usual computing tasks, was very good also thanks to the new dual-core Intel CPU. Battery life with this Asus netbook is quite good as well, averaging about 5.5 hours of battery life, which is just ahead of other comparable netbooks on the market today. The 1215 is difficult to classify, and thus even more difficult to conclude on. While most people label it a netbook, I wouldn’t strictly call it so—I tend to define netbooks as anything with a 10” screen running Atom at a sub-$400 price point. The 1215N has more power, a larger screen, and a higher price tag, but it’s still running Atom so it’s not an ultraportable laptop either. A 12in netbook that manages to outperform its rivals. Thanks to a dual-core Atom D252 processor and Nvidia's ION graphics, the Eee PC 1215N manages to out perform many of its rival netbooks. It's expensive, though, and anyone tempted to splash out should bear in mind that the performance boost isn't exactly monumental. Like its predecessor, the Asus Eee PC 1201n, the Asus Eee PC 1215N netbook offers a bright 12.1-inch LCD display with a native resolution of 1366 by 768 pixels. That moves the Asus from netbook to entry-level ultraportable laptop, but the internals are all netbook-class components - albeit a high-end netbook. Asus delivers a netbook in an ultraportable skin, but price and performance may not satisfy. It’s a testament to the performance of this netbook that I would forgive the keyboard flex and choose this model if I was in the market for a new machine. I have not used another netbook that’s as capable for web browsing, media playback, and games while at the same time having good battery life. The larger screen is icing on the cake while the whole unit remains very portable. ASUS's 1215N is the most powerful Eee PC we've seen, and it's a showcase of what next-generation netbooks could have to offer. Armed with a dual-core processor and both Intel and NVIDIA graphics, it raises the bar for netbook performance but in doing so raises the asking price into notebook territory. Dropping straight into the fiercely-contested £429 marketplace, the Eee PC 1215N faces stiff competition from notebooks such as the Dell Inspiron M101z and tablets such as the Apple iPad. This is a much better pricing compared to the VX6, as you're basically getting the same internals for a lower price. You're still losing out on USB 3.0 in this configuration, but hopefully it can be configured. We really liked the 1215N for its good multimedia performance and decent battery life. It looks great and has a good screen for working or watching movies. My only gripe right now is the mouse buttons that are terrible and unusable (hopefully it's just our unit). Also, we would have liked to see USB 3.0 included at this price. Still, it’s a significant step up in performance and connectivity from a regular netbook, only with a fair chunk of the battery life retained and avoiding the price of a standard ultraportable. Intel’s mobility-focused Atom N550 processor will likely err on the side of longevity (the D525 is intended as a desktop chip) but if your multimedia demands fall between the netbook and notebook camps then the ASUS Eee PC 1215N might well fit that gap. For £429/$485 we can forgive the flexing keyboard and missing USB 3.0 since the performance holds up so well. The Asus Eee PC 1215N is certainly the highest performance netbook currently on the market. Its dual-core processor gives ease of use in office doc processing and the ION chipset handles video very well. It does however struggle with recent video games and suffers because of the disappointing glossy panel, which cost it its fifth star in our rating. 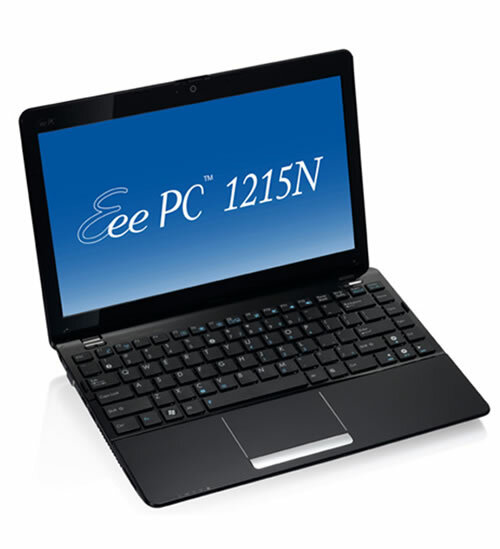 The Eee PC 1215N is an impressive netbook, especially if you want something larger than the 10in, 1024 x 600 norm. You pay for the privilege, but the premium gets you a machine that can just hold its own against similar sized sub-notebooks with higher-class CPUs - and put their various GPUs all to shame. We still maintain that Asus should tweak a few design aspects, including the single trackpad bar and the painfully glossy display and somewhat flimsy build materials. We were also let down by the lack of Bluetooth 3.0 and USB 3.0; we're hearing that some international 1215N SKUs will have these technologies, but not the $499 U.S. model. That's a real shame. Growing larger on the outside and more powerful on the inside, netbooks here in late 2010 are resembling regular laptops more and more every day. Helmed by Nvidia’s Optimus technology and a dual-core processor, this netbook zooms past its peers. Anyone undecided between a portable netbook and a full-featured laptop should consider this system. The sample of 1215N that we've had tested proved to be an all-around good one - it's responsive and enables fluent work, at least in terms of what you'd expect to be doing on an Eee PC. NVIDIA graphics, multimedia capabilities - especially HD video playback - and good battery autonomy all add to this netbook's value, which, owing to its decent keyboard, needn't only be a secondary, "on-the-fly" computer. Although the final price of this model hasn't been revealed to us just yet, we'll make an approximation; the model with 2 GB RAM (instead of 4 GB) and a 250 GB HDD (instead of 320 GB) costs 450, which, with all the other advantages that we've mentioned, gives a decent price/performance ratio. Since the start of the Intel Atom era, we've longed for one thing: a dual-core version of that otherwise impressive power-saving CPU. The Asus Eee PC 1215N combines Intel's dual-core Atom CPU with Nvidia Ion graphics and Optimus GPU-switching for an impressive overall package, but one that still feels a bit too much like a Netbook. After all was said and done, I think that the ASUS Eee 1215N really performed well for its expected use. This machine came in dead last on a couple of my benchmarks, but obliterated all but one of the competition when it came to battery life. That positions this netbook in the perfect spot for the person who is less worried about being able to do things like encoding media and more into a machine that can stream video between classes or meetings and has the power for average computer work when you need to be all business for a very long time on a single charge. This might be the perfect netbook to complement a larger, more powerful, but less portable full notebook or desktop computer. If you are into a lot of media encoding and editing, the 1215N might not meet your needs alone, but if you want a platform for movie watching and entertainment and have a second machine to do the heavy workloads, the 1215N is a great option. Once you take away all the things that hamper traditional netbooks a slow CPU, limited RAM, Intel graphics and add a 1366x768 screen, Windows 7 Home Premium 64-bit, and an HDMI port, is the end result even still a netbook? We say yes: the 1215N is sleek and doesn't feel cheap, but at $500, it's not breaking the bank or, at just over 3 pounds, your back. We defy you to get similar performance from a $500 ultraportable. ASUS has once again shown why the Eee PC line of netbooks remains popular with many consumers. 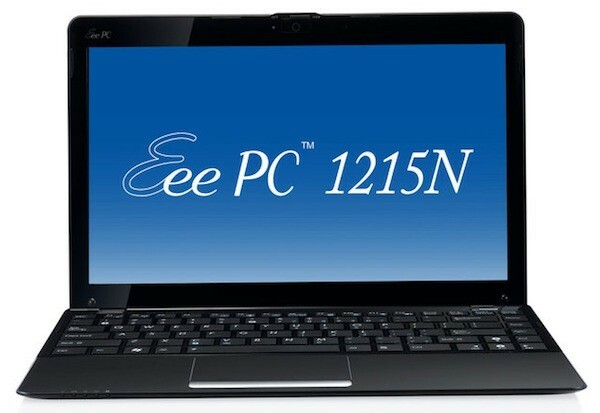 The new Eee PC 1215N offers the best overall performance we've seen from an Atom-based netbook. Battery life isn't as good as the best single-core netbooks, but it is better than the previous 12-inch Eee PC. In truth, the only things we didn't like about this netbook were all related to design. First, the keyboard was too bouncy and the touchpad buttons are just horrible. We also would have liked to see easier access to the hard drive and wireless cards since many well-informed owners add new hard drives or SSDs to their netbooks. Still, it's hard to find another 12-inch laptop that offers better performance for just $500 retail price. If you want an ultraportable netbook with a good screen and good performance for less than the price of a CULV-based notebook then the ASUS Eee PC 1215N probably belongs at the top of a very short list. 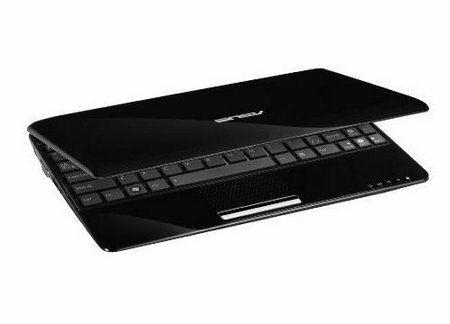 With all those amazing specs and performance, the Asus Eee PC 1215N is more like a sub-notebook than a netbook. It has Optimus Technology that translates in more efficient battery usage based on the CPU load and finally, it lets you play some of the most amazing games out there, at low/medium detail. The use of Atom D525 and next-generation ION graphics is a winner combo as it scored nearly 1000 points more in 3DMark06 benchmark compared to Asus 1201n that came with Atom 330 and first-generation ION graphics. If i were to go for a compact computer with good multimedia performances, the Asus 1215N would be that one. It is good looking, well built and powerful, so definitely a good pick. It is true that for about the same price you can get laptops with ULV hardware; those will be faster in everyday tasks, because of the better processors, but will not be a match for this one in terms of graphics.